A late start to South Africa’s corn growing season threatens to significantly curtail production in what has traditionally been the region’s grain-growing powerhouse. Drought kept seeds from going into the ground for weeks. Partly as a result, South Africa’s area planted to corn is 7 percent below what was expected. 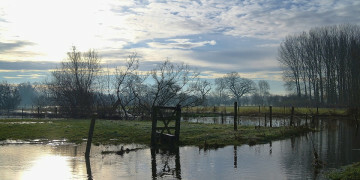 What is growing is at increased risk; with soil moisture low, the crop is especially vulnerable to additional setbacks. This could result, for instance, from a moderate El Niño climate occurrence that is affecting weather patterns in the region this year and that often brings dry conditions. 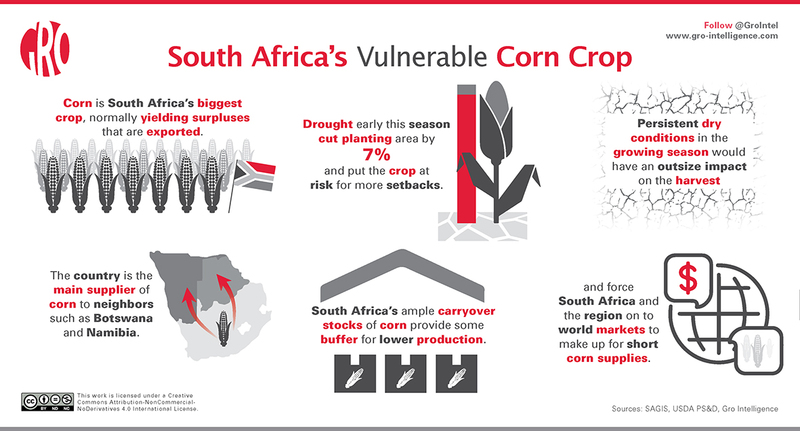 In this Weekly Insight, we assess the progress of South Africa’s corn crop, which will be harvested starting in April. Satellite-derived evapotranspiration maps show the lasting effects from December’s drought. And while current production forecasts combined with existing inventories would enable South Africa to maintain exports this year, any further reduction in crop expectations may motivate consumers to turn to imports to supplement supplies. South Africa has already purchased a cargo of corn from Brazil for the first time since the drought plagued 2015/16 season. South Africa is one of the largest grain producers, and the largest exporter, on the continent. It is also consistently a top 10 country globally for corn exports and is relied upon by neighboring sub-Saharan states to feed their people. In the past two years, South Africa had the two highest-yielding corn crops on record. But in the two years prior, the country was hit by severe drought and was forced to import corn to fill domestic needs. In 2015, South Africa suffered from the driest year on record dating back to 1904, according to the South African Weather Services. The drought started in the beginning of the year, damaging yields for the 2014/15 crop and resulting in a 29-percent drop in corn production. El Nino conditions prolonged the dryness throughout the year, which prevented farmers from planting the next crop despite high corn prices. In 2015/16, only 75 percent of the original planting intentions were eventually harvested. Commercial harvested area was the lowest since the 1927/28 season and production dropped another 23 percent. Over the two seasons of 2014/15 and 2015/16, South Africa imported more than 4 million tonnes of corn to bolster supplies and cover consumption. The graph on the left shows the sharp drop in yield during the two-year drought spanning the 2014/15 and 2015/16 seasons followed by a tremendous recovery in production due to expanded area and record yields. The graph on the right shows how South Africa is typically an exporter of corn, but occasionally requires imports when its crop is poor. This year, South Africa may be forced to become a net importer of corn once again, due to drought conditions in the main planting region. Minimal rainfall in the central and western parts of the country through most of December prevented farmers from planting during the optimal window. Widespread rains in the last few days of 2018 did allow for significant progress, but planted area was lower than initially intended. There were estimates that planted area could be 20 percent lower than the Intentions to Plant report issued by the Crop Estimates Committee of the South African Grain Information Service (SAGIS). The worst case fears eased a bit when the Preliminary Area Planted report from SAGIS showed only a 7-percent drop from intentions and a 2-percent decrease from last season. Futures prices for white corn jumped more than 30 percent to the highest level in two years due to the drought, which may have motivated some farmers to plant even though it was very late. Prices have dropped a bit following the report on planted area. Soil moisture levels remain low in the provinces of Free State and North West, which produce the majority of the country’s white corn crop. White corn is the all-important ingredient in a local staple food known as pap, a type of maize porridge, and is also the variety that is exported to neighboring countries. Some white corn is used for animal feed, but in the previous major drought, white corn supplies were only sufficient to cover human consumption. Yellow corn, grown predominantly for animal feed, was needed to cover the shortfall. Argentina and Brazil provided exports of yellow corn, while smaller quantities of white corn were imported from Mexico and the United States. South Africa is currently expected to produce 10.7 million tonnes of corn, according to the recent International Grains Council forecast. That is sharply below last year’s 13.5 million tonnes, and barely enough to satisfy domestic consumption, typically around 11 million tonnes. The map on the left shows a drought indicator based on evapotranspiration through January, which clearly illustrates a deficit of moisture for a large section of the country. (Deeper orange color indicates more severe dryness.) The map on the right shows NDVI compared with the 10-year mean, which highlights the vegetation that is suffering from the drought conditions. However, estimates for beginning stocks for the new season starting May 1 are around 3 million tonnes, unusually high following record production in the past two years. That total supply should cover domestic consumption and leave room for exports. But any further reduction in crop forecasts due to area planted being revised lower or dry weather during pollination may drive further imports. Already, 50,000 tonnes of yellow corn from Brazil were imported last month and another 40,000 tonnes are expected to arrive in March. South Africa provides the majority of corn through exports for several small neighbors such as Botswana, Namibia, Lesotho, and Eswatini that have minimal production of their own. It also supplements local production in Zimbabwe and Mozambique. In nondrought years, South Africa typically exports around 2 million tonnes, but this dropped to less than 1 million tonne during the recent two years of significant crop problems. As the current growing season progresses, weather forecasts will be closely watched, since it can bring both good and bad surprises. Despite a dry planting season last year, for example, abundant rains during pollination and grain-filling stages resulted in yields that were well above expected trends. El Niño occurrences, formally called El Niño-Southern Oscillation (ENSO), often bring below-normal rainfall to South Africa. According to the South African Weather Service, the current El Niño has strengthened marginally and is predicted to last for the next several months. Although January had below-normal rainfall for the corn-growing Free State and North West provinces, above-normal rainfall is expected in the February to April period. 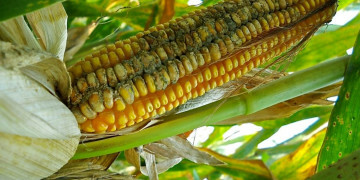 However, it’s unclear what will follow, in the April to June period, when South Africa’s corn is approaching harvest, the weather service said. 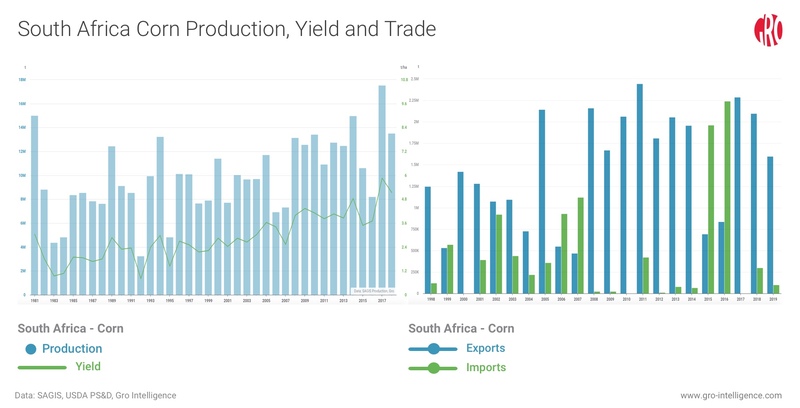 The current supply and demand situation for South African corn is a far cry from three years ago, when two consecutive crops were devastated, available stocks were depleted, and record levels of imports were needed. However, it is clear that South Africa is moving away from the very comfortable supplies and low-price environment of the past two years. 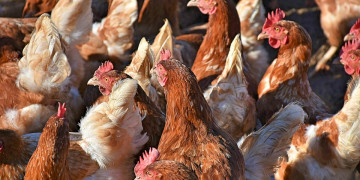 Industry lobby group AgriSA and the National Emergent Red Meat Producers’ Organisation have both appealed to the government for relief funds to assist producers hardest hit by the drought. SAGIS will release its first production forecast for summer crops at the end of February, which will include a revision for area planted. A surprisingly low forecast could spark another rally in domestic prices, which will lead to more imports. In any case, South Africa’s corn production this season is unlikely to cover both domestic consumption and exports without dipping substantially into available stocks.